Tom Izzo is expected to have much of his latest Final Four team back next season at Michigan State. The Hall of Fame coach was not in the mood to celebrate that after Texas Tech eliminated the Spartans with a 61-51 victory at the Final Four. “You never can feel good because you never know if you’ll ever get back here,” Izzo told reporters. Michigan State will have to replace departing seniors Matt McQuaid and Kenny Goins, who will be missed for their outside shooting, defense and leadership. Every other player on the roster has a chance to return, which could give Izzo another shot at the second national championship he desperately craves. All-America and Big Ten player of the year guard Cassius Winston and forward Nick Ward may enter their names in the NBA draft before ultimately deciding whether to stay in school or go pro. Ward, whose season was stunted when he broke his left hand, returned last year after initially declaring himself eligible for the draft. Winston and Ward were not ready to talk about their future shortly after the loss Saturday night. Nor was Izzo. “The last thing I’m going to talk about is anybody leaving,” Izzo said. Forward Xavier Tillman , who had a breakout season, was willing to commit to returning. “I’ll be back for sure,” Tillman said. And, he predicted, the experienced and talented team could win it all in 2020. If Winston and Ward both return, they would lead a lineup that includes fellow senior Joshua Langford, Tillman and Aaron Henry, who showed promise as a freshman as Langford’s replacement as a starter. Reserves will likely include Kyle Ahrens, Gabe Brown, Thomas Kithier, Marcus Bingham, Foster Loyer and incoming freshmen Mark Watts and Malik Hall. “If we come in with the same attitude that we’re not entitled to anything and we have to earn everything, we should be fine,” Tillman said. The Spartans overcame a lot to win 32 games — one short of the school record — and the Big Ten regular-season and tournament championships and to knock off top-seeded Duke to make the Final Four. Izzo has led the program to the Final Four eight times in 21 years, appearing in college basketball’s showcase more than any other school during the same stretch, but he has gone to the Final Four six straight times without winning an NCAA title since 2000. 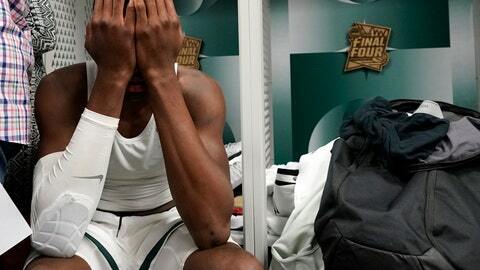 Michigan State was not expected to contend for a national championship this season. It lost Miles Bridges and Jaren Jackson, NBA lottery picks who left last year as underclassmen, and a trio of role-playing seniors. During the season, Langford’s season ended in December with an ankle injury and Ahrens’ injury-riddled season ended with a hurt ankle in the Big Ten Tournament. “Imagine if we would have had Josh on the court,” Tillman said. “I think we would have gave it to him and got out of the way. Imagine if we had (Ahrens) on the court, able to give Aaron (Henry) a break. He’s another key shooter and offensive rebounder for us.